The next upcoming Day of Arafat starts on sundown of August 10 ending at sundown on Saturday August 11th, 2019. Day of Arafat on the Islamic calendar falls on the ninth day of the month of Dhul-Hijjah. 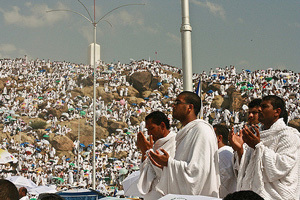 This day for Muslims is a day of pilgrimage to Mount Arafat where they gather in prayer waiting for judgment. Many Muslims will give gifts to their children on this day to show generosity. Some will make the pilgrimage to Mount Arafat to complete Hajj and will cast stones (forty nine stones to be exact) at a pillar the represents the Devil along with much prayer. The Prophet Mohammed on Mount Arafat gave his last sermon thus making it the final stop for Muslim pilgrims during Hajj.